Brooch made ​​of cast brass and finished with hand-hammered brass pin and hardened. Outside diameter 3.7 cm, inner diameter 3 cm. Suitable for the thirteenth century. 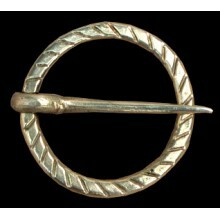 Numerous similar brooches have been found in London and other parts of Europe.